Despite the fact that males have long accounted for the majority of online gamers, there is a surprising shortage of casual online games directed at men aged 25-45. Beyond fantasy football and online poker there is little variety, with nearly every game failing to take advantage of advanced graphics or any interactivity beyond clicking “all-in”. World Golf Tour is looking to fill this gap. The site has launched a free, full-featured Flash game that offers 3D graphics, an advanced physics engine, and user-customizable characters – it’s not as good as EA’s Tiger Woods series, but it’s going to be close enough for most people. The site launched a beta version last year, and is now introducing a new course, expanded customization options, and multiplayer support. CEO YuChiang Cheng says that his team recognized early on that it wouldn’t be able to compete with EA’s massive development team and art department, so it took a few innovative shortcuts. 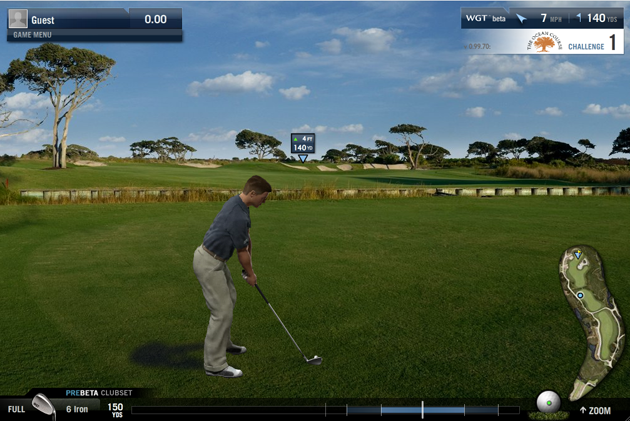 To create the game’s graphics, the WGT team went to the famed Kiawah Island Golf Resort, where it took geo-tagged photographs spanning the entire course. The team then went through and mapped the photos to a 3D model, which makes the world seem three dimensional while telling the physics engine how each part of the photograph should affect the ball. Using technology similar to Google Earth, WGT allows users to move through the course by seamlessly displaying photographs that are adjacent to each other. The result isn’t as immersive as the 3D worlds crafted by EA’s huge dev team, but it’s very impressive. While users will be able to play games on their own, the game allows for multiplayer sessions, and tracks stats across all games to produce a network-wide leaderboard. Along with the game itself, the WGT homepage allows users to create profiles, befriend and challenge other golfers, and participate in massively multiplayer tournaments. Tournaments will include cash prizes as well as virtual goods prizes, like new clubs and clothing that can be used to customize an in-game avatar. WGT will generate revenue through microtransactions for these virtual goods, as well as sponsorships for their virtual tournaments. World Golf Tour will likely do very well – it’s polished, free, and will appeal to millions of golf fans. It may not stand up side-by-side to a console game but its target audience won’t care, especially given the fact that WGT can be played from nearly any browser with no download. For another casual golf game, check out Wii-like iGolf on the iPhone, which we demoed last month.